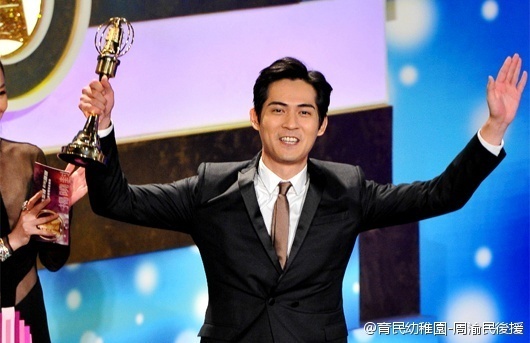 After The Big Upset in 2009–that not only upset his fans but ruined his friendship with Mark Chao as well–Zai Zai finally won Best Actor at the Golden Bell, Taiwan’s version of the Emmy’s. Well done, Zhou Yu Min!!! I was reading the Vic Zhou thread on Asianfanatics and I do understand how his fans have not forgotten his defeat at the 2009 Golden Bell, especially when Mark Chao was an upstart who has yet to prove himself. It is but right to feel vindicated that Zai Zai has finally been recognized for his work, especially after that high-profile loss. I watched BLACK & WHITE. Zai Zai’s role was the harder one because it was complicated while Mark’s was straight-laced. But they were both great in their roles. I suppose it was just unfair to use the same standard on them when Zai Zai had a rich acting background already while Mark, obviously, could not compare to his resume, and yet managed to impress people for his good acting despite being an upstart. Perhaps that’s what tilted the scale to Mark’s favor and I can just imagine how hard it must have been for him to get past that controversy and try to prove that his victory wasn’t because of his father or it wasn’t all a fluke. And I would say, Mark has been able to prove that through the years. Now, Zai Zai. Among F4, he’s always been the one with the depth. It was obvious from METEOR GARDEN alone. He’s often been compared to Tony Leung Chiu-wai and for good reason. I’m also glad that the projects he has chosen since his breakthrough role had been diverse and challenged his acting chops, not limiting himself to dashing, romantic heroes. Hua Ze Lei is still lurking somewhere there with the emos but certainly, Zai Zai has come into his own as an actor and that is what his fans should be most proud of. Of the F4, he’s the only one I haven’t interviewed so I could not really say what he’s like. But I’m glad he’s gotten past his depression and is looking great. It shows in his demeanor and enthusiasm. And it’s heartwarming to see how his colleagues were so overjoyed at his victory (should I be surprised that fake Ken Zhu @kenzhuxiaotian has not greeted him on Twitter? The real Ken hasn’t either on his Weibo.). It only shows that Zai Zai is not only well-loved but respected among his peers. And more than any award, that’s the most important thing, dui bu dui?